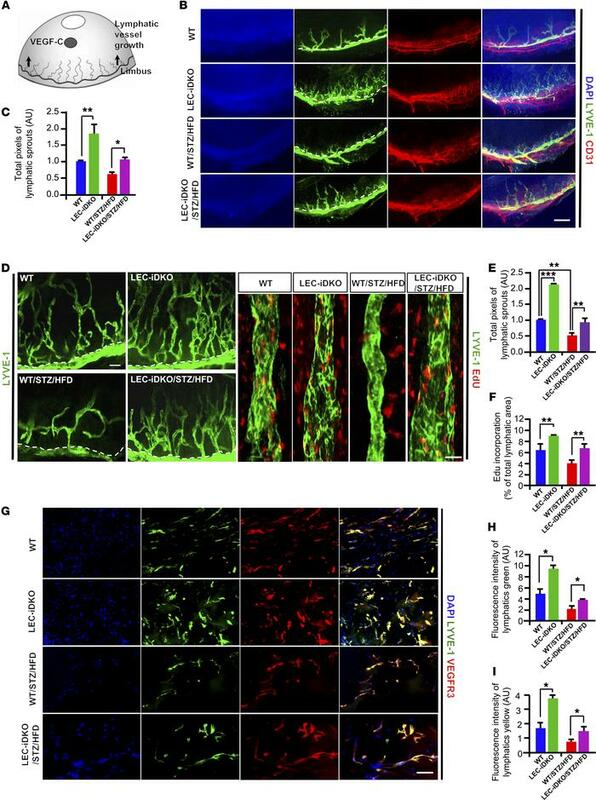 Lymphatic endothelial cell–specific deficiency of epsins promotes lymphangiogenesis in vivo. (A) A schematic diagram of corneal micropocket for pellet implantation. Release of the lymphangiogenic factor VEGF-C from the pellet induces lymphatic vessel growth in the limbus. (B and C) Whole-mount immunofluorescence staining in corneal tissue using antibodies for DAPI (blue), LYVE-1 (green), and CD31 (red) at day 7 after VEGF-C implantation. Quantification of lymphatic vessel growth area in B. (D–F) High-magnification images (×10, left panel of D) show substantial lymphatic plexus in LEC-iDKO mice. Quantification of lymphatic vessel growth in E. Representative confocal Z-stack images show the lymphatic vessels stained with LYVE-1 (green) and Edu (red) in the right panel of D. Quantification of Edu incorporation in lymphatic vessels in F. (G–I) Lymphangiogenesis in Matrigel plug assay. Lymphatic vessels were stained with LYVE-1 (green) and VEGFR3 (red). Quantifications of neovascularization of lymphatic vessels and VEGFR3 localized in the neovascularized lymphatic vessels (yellow) are shown in H and I. Data are mean ± SEM, n = 5. *P < 0.05; **P < 0.01; ***P < 0.001, by 2-way ANOVA followed by Tukey’s post hoc test. Scale bars: 200 μm (B), 100 μm (D, left panel), 20 μm (D, right panel), 50 μm (G).